At Briggs Stadium in Detroit on December 29, 1957, the Detroit Lions won their third NFL championship in six years, and their fourth all-time, with a total dismantling of the Cleveland Browns. After watching their team win 59 to 14, Lions fans surely must have thought that their team would reach the top of the NFL again and again. 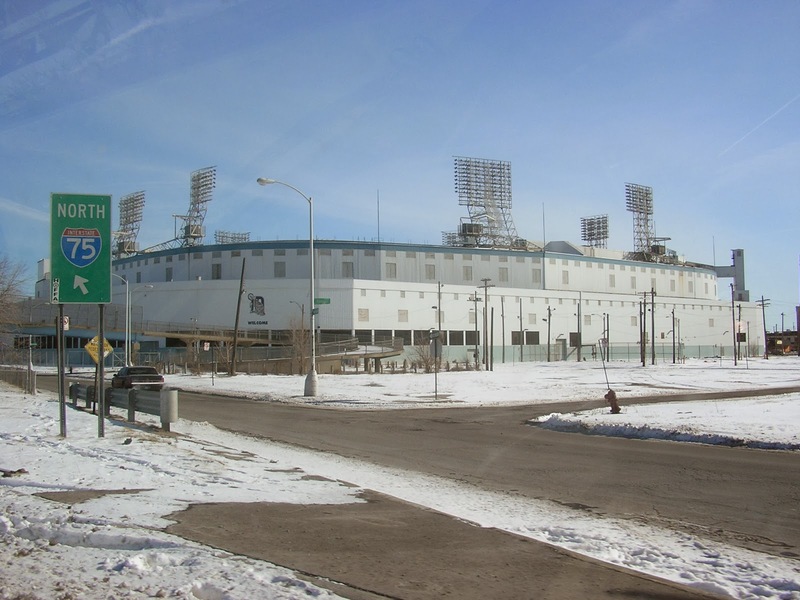 Briggs Stadium later became Tiger Stadium and has since been torn down, and the Lions moved to Pontiac and then back to Detroit, but they never reached the pinnacle of their sport again. They have never really come close, with only 10 playoff appearances and one playoff victory since 1957. The NFL has expanded multiple times since 1957, and the Super Bowl was created in 1967. Nineteen franchises have won Super Bowl championships while the Lions are only one of four NFL teams, and the only current team that was in existence in 1967, to never have played in the Super Bowl. Despite this futility, Lions fans keep coming back for more but with different levels of dedication. The blind optimists (and there is a surprisingly large number of these people) believe every year that "this year is going to be the year" until the Lions are mathematically eliminated from the playoffs. The Lions could be 0-5 with a defense that is surrendering 30 points per game and a quarterback that has thrown twice as many interceptions as touchdowns, and yet they will still think that the Lions are incredibly close to putting it all together and winning out to earn a spot in the playoffs. The realists are not as crazy as the optimists. During the offseason, they think there is maybe a chance if we draft this guy or make that trade or fire this coach or hire that general manager. When the season starts, they might have some hope if the team looks to have the right players, but the realists are usually brought back down to earth by the midpoint of the season. Unlike the optimists, an 0-5 start does not kill them because they were kind of expecting it in the first place based on years of shattered expectations. Plus, they can survive because hockey and basketball seasons usually are starting to heat up right about the time the Lions appear to be doomed. The pessimists, and I include myself in this group, have no hope for a Super Bowl in their lifetimes but still support the Lions because of their stubborn pride for Detroit sports. These fans will scream "Same old Lions!" after the first interception or fumble of the season, even if the Lions are up 28-0 in the fourth quarter. They also relish the ability to always tell other NFL fans, "You think you've got it bad. I'm a Lions fan!" with the hopes that the other fan will buy them a drink out of pity. These fans want to believe, but will not let themselves be duped after so many disappointments. Someday though, they may find a coach and team that will let them believe. Despite the hopelessness of the Lions, and my own pessimism, I still support them because they are my hometown team. Living in the D.C. area now, I wear my Detroit colors with pride and enjoy running into other Detroiters who are visiting or now live in D.C. during football season. It feels like I am home again to be able to agonize with a stranger over the most recent missed kick, bumbled call, or inconceivable safety that cost the Lions a win. One of many plays that would be unbelievable to anyone who is not a Lions fan. He just keeps running as if he doesn't even know he is out of bounds. They lost this game by two points by the way. Recently, a neighbor of mine who is from Massachusetts told me that he decided to change allegiances to the the Washington Capitals and Nationals from the Bruins and Red Sox because his young son liked going to Caps and Nats games. I was appalled because I could never imagine giving up on Detroit's teams because I live somewhere else. Once a Lions fan, always a Lions fan...no matter how soul-crushingly painful it may be. Being a Detroit fan, for better or for worse, is part of my identity. My grandfather was a fan of Detroit sports teams, and so is my dad. My 5-year-old daughter already knows that the Old English D means Detroit Tigers. I want my kids to know that there is something special about cheering for Detroit, even if it means laughing outwardly, while crying on the inside, as the Lions fumble away another season. 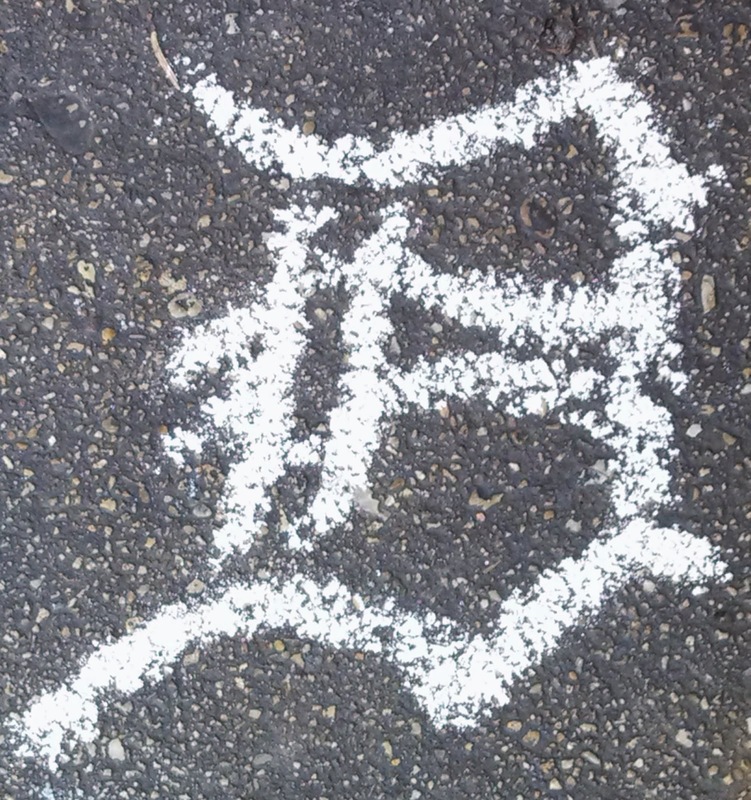 Detroit Tigers Old English D in sidewalk chalk. Being a Lions fan is difficult because only the most loyal fan could support something as incredibly flawed as the Detroit Lions. It is that undying loyalty that makes it worth it though. It's easy to be a fan of a winner, but you must really love your hometown to root for a perpetual loser. Even as a huge pessimist, I know that someday they will surprise us and win the Super Bowl. It will be glorious, and if does not happen in my lifetime, hopefully it will happen when my kids are alive. They may not be huge sports fans like me, but they will know that I would have been happy because I never gave up on my team for convenience or to back a winner.